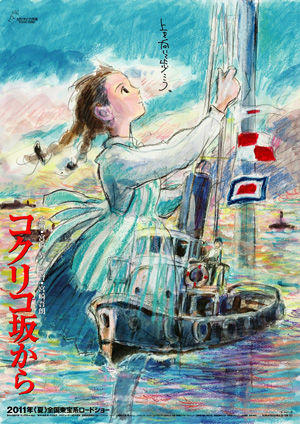 Set in the 1960s in Yokohama, Japan, "Kokuriko-Zaka Kara" follows young teenage girl Umi Komatsuzak. In 1963, Yokohama, Japan, there is an old western style building named Kokuriku Manor which is located on a hill overooking the port. Kokuriku Manor is a lodge which is run by 16-year-old Umi Matsuzaki in place of her mother who as a university professor. Even though Umi is busy in the mornings, she always raises a signal flag which means "prays for the safe voyages of the ships." Umi's father taught her that. At Umi Matsuzaki's high school there's an old historic building which holds the culture club room. Because of the upcoming Tokyo Olympics the city is tearing down old buildings to make way for the new buildings. A campaign is then started by a group of students who wants to preserve the building. By chance, Umi becomes part of the group against the demolition and through the group meets fellow student Shun Kazama. Slowly, Umi and Shun start to become attracted to each other. Conflicts arise when they learn they may be siblings.